Actiiv's Recover line is a 2-step, shampoo-based hair treatment system for men and women experiencing hair loss or wanting to target and combat hair loss early. Using the science of nutraceuticals (natural, plant-based compounds), our Recover products are able to target hair loss and thinning at the source. Our Recover line is a simple shampoo and conditioning process that only needs to be used every other day for 5 minutes in the shower! Wet hair with warm water, apply the a dime sized Actiiv Recover Shampoo Treatment, rubbing into hair and scalp. Let sit in hair for 5 minutes for optimal results. Wash out the Shampoo Thickening Treatment and follow with the Actiiv Recover Unisex Conditioner. 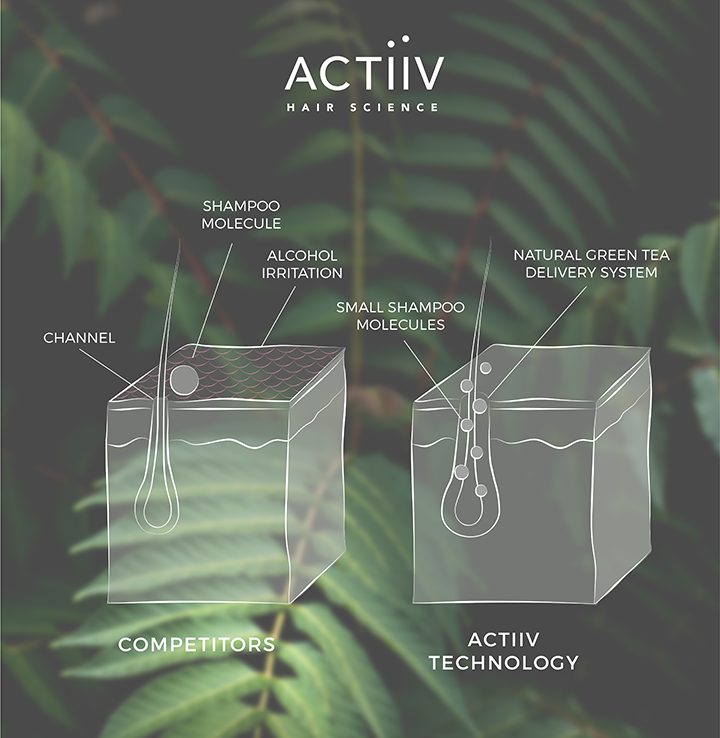 Unlike competitors using harsh alcohols to reach the follicle, Actiiv uses a patented, green tea delivery system. During the 5 minute shampoo treatment, the delivery system temporarily widens the follicle channel to deliver our natural ingredients at the deepest level. The Actiiv Hair Science Renew line is a two-step shampoo-based hair therapy system designed to target damaged and lifeless hair & increase hair growth. Our natural, plant-based ingredients help deliver optimal results while providing the user with a safe, luxurious hair care experience. Our product is unparalleled in convenience and ease of use. Repairs damage to over-processed, damaged, or broken hair. Wet hair with warm water, apply a dime sized amount of the ACTiiV Renew Healing & Cleansing Treatment to hair and scalp. Let sit in hair for 5 minutes for full effect. Wash out and follow with application of Renew Conditioner. Repeat this process 3 times a week for peak results. 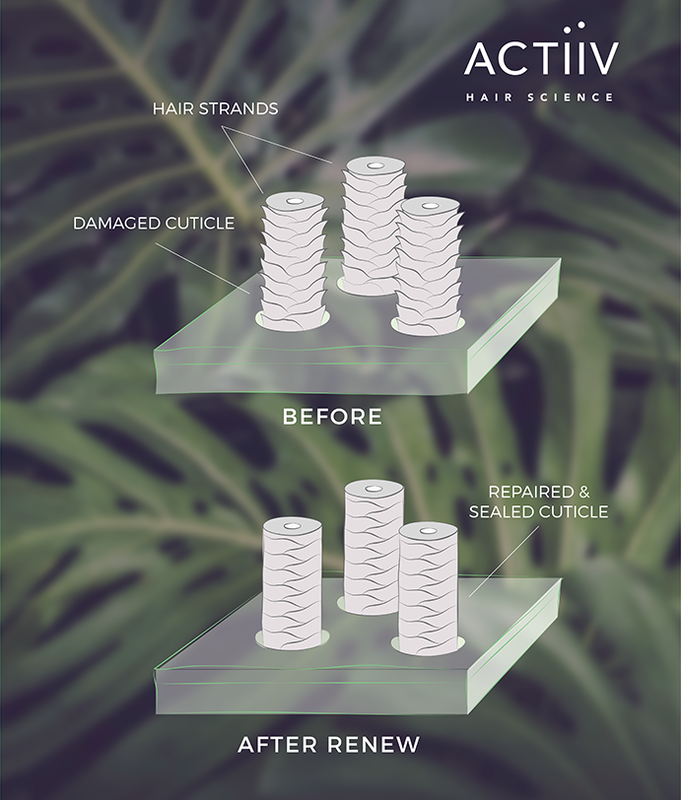 Actiiv Renew repairs and seals damaged, over-processed hair using powerful amino acids and natural ingredients.